A key part of training is constantly working to improve your courses. In fact, you can improve even the most effective courses in your library. One of the best tools you have available as part of this improvement process is feedback. Getting feedback is not as simple as just asking learners to give you feedback, though. There is much more to it than this, which is why it is possible to make mistakes.There are, in fact, eight common mistakes that people make when getting feedback on their e-learning courses. Here they are explained so you can avoid making them. The best time to ask for feedback on the course is immediately after the learner finishes. This is the time when the experience of going through the course is freshest in their mind. If you don’t ask for feedback as soon as the course content ends, you are missing a potentially beneficial opportunity. We often see questions that are far too generic to make feedback meaningful. Specifically, learners find generic questions difficult to answer as there is too much work involved. This increases the chances of them not giving feedback at all. A much better approach is to ask specific questions. For example, a generic approach at the end of an e-learning course is to simply ask for comments or feedback and then giving the learner a box to type in. A more specific approach would be to ask the learner something like: “If you could change one thing about this course, what would it be? The key to getting feedback in the first place, and then to ensure the feedback is as meaningful as possible, is to make it easy for learners to give you feedback. If they see lots of questions, or they end up in a process that has lots of questions, they may not follow through. Therefore, limit your feedback questions to a few, while also following the above tip of ensuring those questions are specific. Not all learners will give you feedback. You can increase the percentage of those who do by making it easy for the learner and by asking for the feedback as soon as the course finishes. You will always have people who don’t give you feedback, though. While you don’t know their reasons, they might just need a little bit of additional encouragement. This means it is worth the effort reaching out again to learners who haven’t given you feedback. The above doesn’t mean questions that are tough on the learner but, instead, questions that are tough on you. Unless you ask these tough questions, you won’t get to know what learners really think, so you won’t be able to make the best possible improvements to the course. There are various forms of closed question but the most common are questions that have a yes or no answer. These can be helpful for some topics, but you also need questions that encourage the learner to elaborate and give you detail. For example, asking the learner if they believe they now understand the topic as a result of the e-learning course, with yes or no as the only options, won’t tell you very much. You should instead ask them something like how they have used the knowledge learned in the course during their working day. Many people responsible for the development of an e-learning course take the feedback they receive too personally. This applies whether that development is in-house or if you use a professional e-learning course developer in Dubai. Feedback is not criticism of your e-learning course, and it certainly isn’t criticism of your efforts to manage the development process. Instead, it provides you with information so you can make decisions on areas that you can work on to improve. It’s not always easy taking feedback for what it is, but it’s important if you want to make the e-learning course as good as it can be. 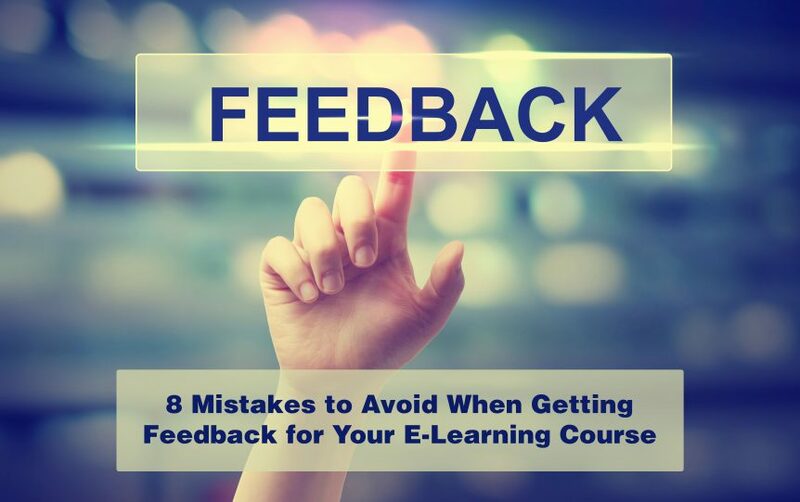 The final mistake to avoid when getting feedback on your e-learning course is ignoring the feedback. This particularly applies if you choose to ignore the feedback because you disagree with what the learners are telling you. Providing you have a robust feedback strategy in place, and you have asked the right questions, you need to take the feedback on board and work the thoughts and views received into your updating and development process. It’s always important to remember the main objective of your e-learning course when considering feedback. An example of an objective you might have is improving a business outcome such as reducing errors, increasing productivity, reducing risk, or making efficiency savings. So, the feedback you get on your e-learning course not only helps you make the course better; it also helps you achieve your objective. This is the real power of feedback, and it’s why you should avoid making the above mistakes.